The family that gathers 'round the radio together, enjoys Family Theater together! Some of radio's finest performers come to the microphone for thrilling tales of adventure, heart-warming comedies, and inspiring real-life dramas -- all with a positive, spirit-building message! 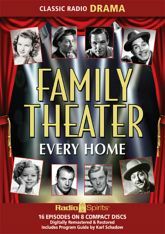 Fred Allen, Shirley Temple, Kirk Douglas, Ethel Barrymore, Gary Cooper, Gene Kelly, Donna Reed, and many more are heard in sixteen digitally restored and remastered episodes.